With more women joining the corporate world and thus, the improved financial capabilities, it has become more common these days for wedding couples to do their pre-wedding photography overseas. This is what we called destination wedding photography. 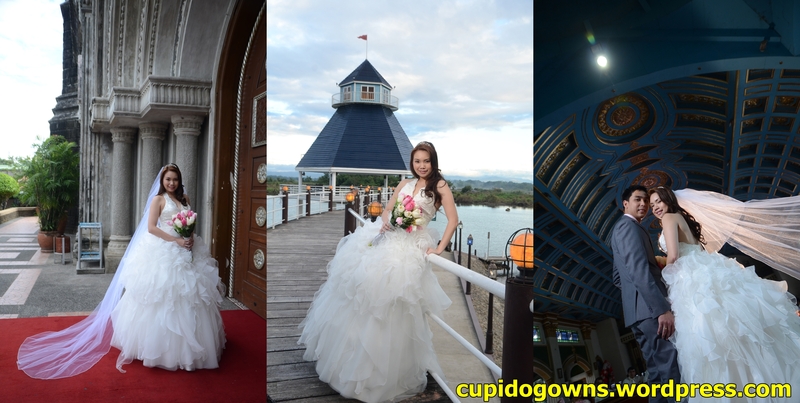 Destination wedding photography is very common among the Chinese in Asian countries. It has been the practised culture that wedding couples will have their pre-wedding photo shoots done before the wedding day and thereafter, sharing these photo albums with their guests at the banquet on the wedding day itself. So what would these wedding couples need to prepare themselves for the destination wedding photography? Most importantly the first and foremost is to ascertain the destination that the wedding couples are going to photo shoot. It can be the country that they have first met or the country where these couples completed their final year study, a destination that call for sweet memories of the wedding couples. They would then need to source for a photographer, either locally from Singapore or at their choice destination itself. Wedding couples should consider the cost before deciding where to engage their preferred photographer. Upon engaging the photographer, wedding couples should discuss the photo-shooting location with the photographer as the selected venues would require appropriate wedding gowns. We would talk about how to choose the appropriate wedding gowns in our next blog post for the destination wedding photography. So stay tune with us. Two days ago, we came across a photo about Chinese Wedding being held on a Fishing Boat in Tai O, Hong Kong. 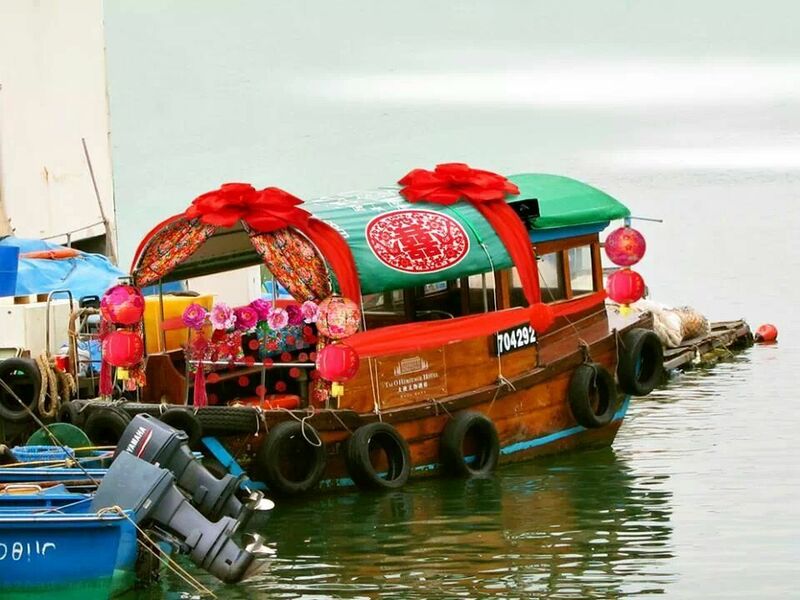 Apparently, there is still this tradition of Water Marriage being held annually in Tai O, Hong Kong with which the Groom will ride on this boat to fetch the Bride to the Groom’s house where the Chinese Tea Ceremony is being held. For such traditional ceremony, Cupido Gowns can’t agree better for the Bride to wear a traditional costume such as a Tea Ceremony Qun Kua and we would recommend this Gold and Silver Sequin Embroidery Qun Kua. Some of you may asked what is so unique about this piece of Qun Kua that we highly recommend. Cupido Gowns would say that this masterpiece is mainly embroidered with gold threading with a pinch of silver thread has make it look outstanding. Also hand sewn with gold glittering sequins and bead works, this Qun Kua look more traditional, yet modern. Furthermore, a third party wedding photographer has shared with us that this piece of Qun Kua has the 3D effects especially the view from the side. The 3D effects come from the dragons and phoenix where the sequins being sewn protruding. Check how true this is by clicking on the photo link above to see more close up photos from our website. With the advent of technology in this era, online shopping had never been easier with just anything that you can name, all within your fingertips. Be cautious! Not everything that you can just shop online without looking at the actual product especially special occasion wear like an evening gown. Cupido Gowns constantly has clients whom had shared with us their dismay in online shopping for their evening gowns. Most times, they get to shop at their convenience from home simply by browsing the online photos, reading the material specifications, providing their body measurements and made payment. Then the waiting time takes within 2 to 4 months before it was delivered to their home. Although these group of clients were enjoying the convenience of shopping from home, when they received the package and tried on the evening gowns, they usually find it a disappointment. And so, they still have to visit our shop and pay another cost to get another evening gown. Why a disappointment? Most online gowns shop in Singapore posted evening gown photos from famous designers by quoting that they can produce the same designer evening gown with probably just a 5% difference from the photo shown. And many times shoppers are not aware that this 5% is the great difference that will damage the entire outlook of an evening gown. Cupido Gowns believe that no other person can make an evening gown that will turn out to be the same as the original designer. Unlike fashion apparels, whether an evening gown can pull off to be an elegant piece relies heavily on the grading of material used for an evening gown and the bead works quality. A slight disparity even in the grade of materials used will change the deemed 5% difference to become a total damage on the evening gown. Furthermore, most shoppers are not expert in taking their own body measurements. Hence, when the ordered evening gown was received, it is common that the evening gown is either too large or too small to fit at all. And when the evening gown had to be sent for further alteration in Singapore, it will incur another heavy expense as alteration for formal wear here is extremely costly. We still remember that back in year 2011, we have Rachel whom had ordered a size 10 evening gown from another online gown shop by merely looking at the photo only. She waited close to 4 months and when she received the package, the evening gown was a smaller than size 6. Rachel had then paid a good S$400 which she could not get a refund, neither can it be altered. Moreover, she had to pay an additional cost to get another piece of gown from us for her wedding. Therefore, to avoid disappointment and a heavy burden on your pocket, it is good to shop with ready-on-the-rack evening gowns. However, make sure that these ready made evening gowns are using only top quality materials. As an extension of our earlier post of How to Choose an Evening Gown, we are going to talk about choosing the colour for your Evening Gown. Again, the first deciding factor will be whether you are hosting an event, such as you are going to be the Bride or you are just merely attending an event like a wedding. When choosing your evening gown, dare to go for striking colours if you are the host of an event as striking colours will make you stand out from your guests. Colours like red, yellow, fuchsia, orange or peach are good colours to brighten yourself up. Cupido Gowns also call them “happy” colours to wear for a formal event. Some of our clients also find that wearing these evening gown colours will bring more confidence to themselves. When you have determined the event that you are attending with the colours short-list, next check if these colours suit your skin tone. Bear in mind that each colour of an evening gown comes in different tones. For example, if you are short-listing a yellow evening gown, make sure the tone of the yellow is the right one for your skin colour. If you lean towards a darker skin tone, a deep yellow evening gown might not be suitable, yet it will further darkens your entire outlook. Nevertheless, this does not conclude that any yellow tone is not suitable for you. Try a soft yellow that will give you a more youthful look. Today we are going to talk about body shapes of Brides with which generally, there are 6 different types of body shapes. Many Brides mistakenly determines their body shape by the size of their body. Remember Brides! Your size does not determine your body shape. Whatever size you may be, understanding your body shape will enable you to fine tune the choice of wedding gown styles that will complement you best. Your bust is well defined and you have soft curves to your hips, bottom and tummy. You generally have little difficulty in getting clothes to fit, so most wedding gown styles will suit you as long as your proportions are balanced. You have a full bust, a well-defined waist, full hips and possibly a curvy bottom. If you get a good fit on the hips, you will often find the waist of skirts and trousers is too large. Close-fitting designs are your best bet. Your bust may be minimal or full, and your shoulders probably narrow and sloping. You will have difficulty finding a shift dress that fits properly. A wedding gown with a full skirt will work well, as will separates. You may have a minimal or defined waist. Dress that show off your shoulders are great for your shape. Straight-line wedding gown styles work well on you, but avoid frills and flounces. You have the perfect shape to add details to your hips and bottom, if you wish. Your appearance is lean and long as you have a minimal bust, just a little shaping around your waist, and flat hips and bottom. You need to consider a wedding gown that really enhances your body shape. A boned bodice and a fuller skirt will work well for you. You may be full or flat chested and your ribcage seems to go straight down to your waist. Your hips and bottom are flat, and you may carry a little weight around your middle. Straight styles are best for you, so look for a wedding gown that gives the illusion of a waist. Sometimes Brides may find that they fall between two different body shapes. At such situation, make sure that you take into account your scale (petite, average, grand) and proportions (high waisted, low waisted) as this will affect the suitability of various designs when choosing your dream wedding gown. As we have classified our coloured long gowns into Evening Dress and Dinner Dress Categories as published on our website at http://www.cupidogowns.com/, we are going to talk about the fundamental difference in determining our categorization. To ease the shopping experience of our clients, this article will assist to determine what kind of event is suitable for an evening dress and likewise, for a dinner dress. If you have browsed through our evening dress collection, you will notice that most of these evening dresses are heavily beaded, more classy on its outlook and some even comes with a train. Thus, an evening dress is very much suitable if you are a Bride needing a coloured gown for your second march in during your wedding dinner banquet. Having said that, Evening Dress is not constrain to just for Brides. If you are contesting for pageants or you are attending a gala dinner, an evening dress will be an appropriate choice to bring out more elegance in your look. Coming back to Dinner Dress, these are more down-to-earth dress that you can wear for just any occasion like attending a wedding dinner of a friend or relative. These dinner dresses are more simple in terms of design and less bead works. Yet, with appropriate dress accessories to match, a dinner dress can also be an elegant piece to wear. For instance, some of our clients asked; I am a mother-of-bride and my daughter’s wedding dinner banquet is going to be held at a grand ballroom in Singapore. In this situation, Cupido Gowns advise you to wear an Evening Dress as it is good for hosts to dress up a little more so that they won’t blend in with their other guests. Following our earlier blog on Don’t Judge a Book by its cover when Choosing a Wedding Gown, this time we would like to share that there are still some fundamental guide on the basic shapes for Brides when choosing a wedding gown. The basic styles of wedding gown have barely changed over decades. However, there is still fashionable influences as far as necklines and fullness of the skirts are concerned, but fundamentally the shapes remain the same. Brides would need to identify which shape meets their aspirations while making sure it works for their body shape and wedding style. Shift Cut Wedding Gown : From the first picture, a shift cut is basically a simple, straight gown with straight darts that will skim the body. The gown can be long or short, with or without sleeves. Because of its simplicity, a shift can easily be enhanced with beading, embroidery and lace. If wished, a train can be incorporated into the wedding gown. You may want to consider a slit in the gown, which will make walking easier as well as adding length to your legs. Empire Cut Wedding Gown : This is another simple line with high waist emphasis just below the bust. The high waist detail can be as narrow as a single seam or as wide as a cummerbund. This is a good shape if you are small-busted. The gown will flare out gently from where the waist seam finishes and its fullness should be determined by your height ie. the taller you are, the fuller the gown can be. This is a wonderful style to wear if you are going for comfort first or in a flowing fabric if you are a mother-to-be. Bias Cut Wedding Gown : The secret of the bias cut gown lies in the cutting of the fabric. This is done across the grain of the cloth and gives a soft, fluid and feminine look to the finished gown, which will skim the hips gently. It is much more suitable for softer fabrics. If you wish to incorporate a floating, fluid train, this is the ideal style to choose. Fishtail Wedding Gown : The fishtail is a variation of the shift, with slightly more waist emphasis and a close-fitting gown that fans out at the bottom, either all round or just at the back. This really works best on a long style and is ideal for decorating all the way round. It creates a very glamorous look which will give the illusion of longer legs. However, take care where the gown starts to flare to ensure you can walk easily. A-line Wedding Gown : This gown style is in between the shift and the ball gown. The top is fitted and the gown flares out as little or as much as you want. This style is ideally suited to a two-piece combination and is therefore the most flexible for many brides as you can mix fabrics and colours. For extra detail, pleats can be added to the bottom part of the gown if you need to enhance your hips. Ball Gown Wedding Gown : This is the gown most brides dream about. The bodice is closely fitted and the bottom gown is very full. It is extremely beautiful with its layers upon layers of fabric, petticoats and train, often intricately decorated with beads, pearls and sequins. If you are petite, keep the bottom gown volume to a minimum. This style works particularly well if you have long legs or want to disguise full hips or thighs. When visiting a wedding gown shop in Singapore, many Brides landed on merely browsing through the racks of wedding gowns on display. At Cupido Gowns, we advise our clients to fret not to just browsing these wedding gowns. Sometimes, a piece of wedding gown may not look outstanding when it is being hung up on the rack and Brides would just reject these pieces as they deemed these wedding gowns as not attractive. Be warn! and this is Cupido Gowns’ advice to you that looking at wedding gowns with plain bare eyes may not tell you the secret of the gown being special and this do the wedding gown with no justice. Wedding gowns on the rack may not look attractive while hung up and to your surprise, it may turn out to become your dream wedding gown when you wear it. As much as you can, Brides should try on any wedding gown that you can possibly lay your hands on. However, do bear in mind not to spoil yourself with choices. Always limit the gowns that you shortlist to possibly 5 pieces, otherwise you may end up more distress for being confused on which wedding gown to choose. This is a piece of wedding gown that gives the dreamy feel. Want to own this gown? Click on the photo to book with us now. Often times, our clients shared with us that prices of wedding gowns are extremely expensive in Singapore until they found us at Cupido Gowns. Especially so if the gowns are from bridal shops. Have you asked why these bridal shops are renting wedding gowns at superficial prices? Most instances, wedding gowns at these bridal shops are priced to include operating costs like shop front rental space, manpower costs, utility charges and other cost of operating the shop front. Yet, most of these bridal shops do not entertain a mere rental of wedding gowns. These bridal shops usually run roadshows around Singapore city for couples to sign up wedding photography packages with them. Couples whom ignored their groundwork for shortcuts and those whom look for one stop service would usually signed up for the wedding packages with these providers, only to their disappointment later. Some of our clients whom had paid a couple of thousands for the wedding package, had shared with us that they could not find a wedding gown during the selection process. And why is that so? These are mainly due to the “better looking” wedding gowns have been classified under the premium racks and to choose from this category, Brides are required to top up at least another thousand dollars to be able to enjoy their desired wedding gown. Why not avoid all these hurdles in your hunting of a dream wedding gown with an Online Gown Shop like us? At Cupido Gowns, we provide equal and sometimes beyond the quality of what bridal shops have to offer. We bring in top quality wedding gowns at a fraction price of these bridal shops’. Our price has been discounted with the cost of shop front rental space, salesman costs and other operating costs of a shop front. Best of all, our price includes alteration charges and dry-cleaning (for rental only) which may cost a bomb to Brides.